My Very Best Friend — Ends in Style. This is a style blog, mostly interior design style, and only partly a blog since I so rarely write it these days. Today, it’s a blog about a dog. My best friend, my baby, my Weezy girl. Let’s start at the beginning. In 2010, I was going through a terrible break up—one of several breakups with the same guy, actually. An on-again off-again disaster. If 2019 Susie could talk to 2008-2010 Susie, she would say “YOU ARE BEING SO DUMB. WALK AWAY!! !” Then again, 2019 Susie would say that to probably 2003-2012 Susie too…but I digress. 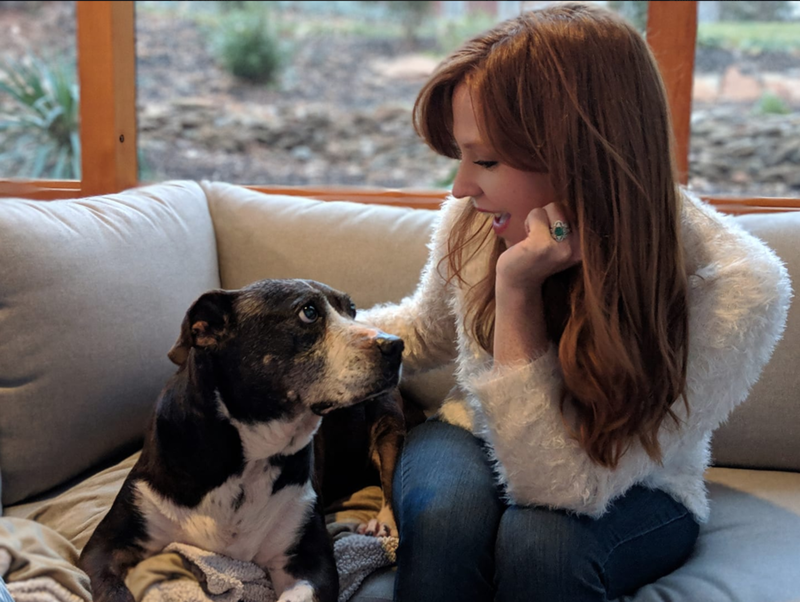 I felt like I had all this love to give but where I was trying to give it was wrong—and I love dogs—so I got on Petfinder.com. Now I know, it’s never really advisable to get a pet while in college and only employed part time, and I know it’s never really advisable to get a pet to soothe a broken heart, but I have never been great at listening to what’s advisable. On Petfinder, I filtered for female, large, adult dogs because that’s what we always had growing up and my parents had recently adopted the sweetest dog on planet earth, Sweet Potato, a large adult female dog. Scrolling through the dogs, it’s enough to break the hardest of hearts. So many cute faces longing for a home. But then I saw her. Sassy. That was her name then. She was about 10 miles away in Register, GA and she was the most beautiful girl I’d ever seen. Like a mix of Sweet Potato and our beloved family dog Ginnie who had passed away when I was a sophomore in college. A bulldog looking mix with dark chocolate brown/black and white fur and the perfect blend of goofy and regal. I had to meet her. So I did! Sassy was at a doggie daycare facility called Dogs Live Happy that houses adoptable dogs for STARS (Save the Animals Rescue Society in GA). She came racing out from the kennels in the back wiggling and happy and immediately rolled over on her back at my feet asking for a belly rub, grunting and honking like a pig, and promptly pooting a VERY stinky dog fart. I loved her immediately and I knew she would have to be renamed Weezy because of her adorable wheezing grunts. Sara Jane (my sister), helped me pay the pet deposit for my rental house though Mama disapproved of me getting a dog in college. Again, I didn’t listen to wisdom, I needed this girl in my life! We had a group of people over for a study the night I brought her home and she gassed the place up. I think it was nerves. Poor thing, but she loved every person who came over and made life so much happier and more fun! Anyway, nothing brings a group together quite like being crop dusted by a dog! For those last few months in college, Weezy helped me heal. She wasn’t thrilled about the idea of other dogs and that was challenging, but I’m happy to say she’s learned that other dogs aren’t so bad. Weezy and her first and best friend, Sweet Potato, who was an angel on earth. We shared a twin bed and though it was 1,000 degrees and I often had a paw in my face, I don’t think i’ve ever slept better than those months. She was a MAJOR food hound and while we were living in that rental house and sleeping in the twin bed, she managed to get into the trash several times, counter surf, and once even was caught on the kitchen table polishing off the last of the Valentine’s chocolates that my friend and roommate Suzanne received from her boyfriend (now husband!). I’m thankful for sweet and understanding roommates :) We replaced the chocolates and cleaned the table, but a lesser person might not have laughed about it like Suzanne did. Weezy came with me when we moved into an apartment with my friend, Sarah in Columbus, GA. We stayed there for a month or two while I job hunted. It was the summer of 2010 and it was HOT in Columbus. We went on walks in the park across the street from the apartment and Weezy frequently laid down right in the middle of the walking path. Totally flat. There was nothing I could do but look sheepish and apologize to passersby. If they didn’t think it was funny and cute, I had no use for them anyway. It was, factually, funny and cute. We got used to being together a lot. I was making jewelry I planned to but would never actually sell on Etsy, applying for jobs, and hanging out with my dog. Then, I got a job. Weezy trying hard to relax. In October 2010, we moved to Atlanta and I started an 8-5 (ok….9…I’m no early bird) job and Weezy was alone for most of the day for the first time. I chose an apartment close to work so that I could come home at lunch and walk her. I tried crating her during the day after a coffee table, wooden laundry drying rack, and some other junk met their untimely demise by way of being chewed to bits. That did not go well. Weezy somehow squeezed her way out of the crate with a closed and latched door and the latch was still closed when I came home. I still don’t know how she did it. I even got a padlock to put on the door and somehow she did made her way out but not before shaking the crate and slamming that padlock into and through the wall. Oops! One day, out of desperation (and a severe lack of money for doggie daycare or a dog walker), I put her and her water and bed in the bathroom and closed the door. Big mistake. Huge. I came home at lunch to find wooden chips flung from under the bathroom door. When I opened it, the hollow core of the cheap apartment door was exposed and the moulding around the door was removed and chewed with beaver like precision about halfway up. Bye bye, security deposit! I started to clip coupons to save on groceries and Weezy got to go to doggie daycare. She’d made her position known on the matter. One day, a bag of trash with a deboned rotisserie chicken was left by the front door while I was away. Not by me, but I wont name names to protect the guilty party. Weezy ate everything in that trash bag. And I mean EVERYTHING. I was in a full panic when I discovered she had eaten the chicken since it can be deadly as cooked chicken bones can splinter. I rushed her to the vet who did x-rays to see if she could pass the bones or if they needed to come up/out another way (yikes). The vet came into the exam room with a concerned look on his face and asked if I knew what kind of trauma she had endured. My Weezy was filled with pieces of shot from a shotgun! Now her intense fear of thunder, the clap of a trash bag snapping open, any loud sound was making a lot more sense. Not only that, but there was evidence in these x-rays that suggested her back had once been broken and healed on its own and not very well. This explained her sway back. I sobbed and hugged her, and she passed the chicken bones unharmed. A couple of years later, we moved in with two roommates, one roommate, Amanda, had a tiny Westie named Maisie. Maisie was very vocal, and Weezy didn’t care for that, and like I mentioned, she wasn’t wild about other dogs. We had a couple of run-ins but things eventually went smoothly in the house, we just had to keep up a baby gate for peace of mind when nobody was home. We all had very well stretched legs/groin areas from stepping over the baby gate so we didn’t have to move it. Writing this, I’m realizing more and more how patient my friends and roommates have been over the years. Thanks, y’all! One day, my roommate Amanda came home from a birthday party with a box of brightly colored frosted cupcakes. 18 cupcakes to be exact. She put the box on the dining table and went about her day, leaving the house for a short time. I can’t remember now who discovered it, but someone came home and saw a totally empty box of cupcakes on the table with no papers in sight and the lid closed back. We were all so confused by it until Weezy lumbered into the room with a belly that looked like she was 12 months pregnant and the tiniest bit of blue frosting on her nose. Almost got away with it! A bag of flour, more than once! Like I said, food hound. No matter how much she got into and ate, or what “bad” things she did, at the end of the day, she would put her face in my lap and sigh and my entire heart would melt. Not only a food hound, but a lap hound too, Weezy would climb into the lap of anyone, stranger or not. She adored my Daddy (she called him Papa, of course), and the feeling was mutual. She stayed with my parents often over the years when I was traveling. A couple of days would pass with us back in Atlanta and I would get a call from Daddy, “Does Weezy miss me?”. I didn’t appreciate how sweet and wonderful that was until I lost Daddy. So many things with people are hard to appreciate in the moment. It’s so easy to get bogged down in things that are hard with the ones you love because people can be frustrating sometimes and we expect so much of each other. Dogs can be challenging, sure, but day to day appreciation of what they bring to life is much, much easier. Maybe it’s because we don’t have a list of expectations—we just love them and they love us more than is possible to understand. And they need us. They rely on us for their food, shelter, care, love, play, potty breaks, all of it. And it’s the most incredible feeling. Weezy looks at me with eyes that say “I love you!” more clearly than words ever could. She is a comforting presence, a place I can go to just “be” and feel loved and lavish affection on her that I’d feel insane doing to a person. I give her probably 30 kisses on her head each day and tell her I love her, how beautiful she is, how lucky I am to be her mommy, and that I’ll miss her so much when I’m gone—and I mean every word. A person would rightfully be very freaked out by that level of gushing, but Weezy? She loves it. Her favorite thing is to sit by or more accurately ON me stare at me, and eventually fall asleep in my lap, and it’s my favorite thing, too. This past year has been incredibly difficult. Weezy’s injuries all those years ago have caught up to her. She’s slowed down considerably and is no longer able to go on walks even if we were to lay down in the sidewalk and take a break. She slips and falls frequently despite the shoes and grippy paw pads I got for her. She started barking at what seemed like nothing, especially when we had company, especially at night, and she seemed confused at night. Over Christmas she had a seizure in a Taco Bell parking lot as we made our way to North Carolina to see Victor’s family. After that, she couldn’t really walk on her own for a few days. She bounced back like she always does. She is the most resilient creature ever, I’m sure of that. As the weeks have gone by, the anxiety medication to help her sleep and be calm at night has begun to be less effective, and the pain medications seem to be only minimally helping, her ability to walk on her own has diminished so much that I worry when she stands up because I know without my help, she will fall and possibly get really hurt, and as she sits beside me, snoring and breathing deeply—the two most soothing sounds I have ever heard, I’ve had to make the decision to say goodbye to my best friend. She’s in pain. She can’t walk and move around like she wants to, and at 13 years old, she wont improve. This is, without question, the single hardest thing I have ever had to do in my life. And I know it’s the loving thing to do, but it’s the last thing on earth I want to do. My match profile photo — she looks so young and beautiful! She’s given me more love than I deserve. She brought me smiles through tears after several stupid breakups, a job layoff, and other dumb 20-something concerns. She even brought me smiles through tears as I grieved the death of my Daddy. It was really hard to smile about much for quite a while after he died, but she helped me. She was even in my profile picture on Match.com, which is how I met Victor. So in a way, I think it’s safe to say she helped me meet my husband. Because of Weezy, I’ve known a great love. And because of Weezy, Victor experienced the love of a dog as special as my baby. Tomorrow, in our home, a vet will come and help us peacefully say goodbye with her mommy and daddy by her side, and my heart will break. I don’t want to think about being without her. I’ve become who I am with her and she’s my favorite. She is the best and I am so thankful and lucky to be hers. Weezy sleeping in my Daddy’s lap. They loved each other so much! I wrote all of the above last week. I can’t believe it’s been almost a week. I wanted to come back and finish writing this, but it’s just been too hard. Weezy was, is, and forever will be my baby and best friend. Being without her is the hardest thing. I miss her every minute of every day. On Saturday, January 19th, after she had every food she could have wanted and we had a slumber party on the living room floor, and she and I snuggled together for hours, Lap of Love Atlanta sent out the most kind vet, Dr Lauren Cassady. She was so gentle and sweet and helped me to feel confident that this decision was the right one for Weezy. When Dr. Lauren arrived, Weezy didn’t even lift her head. No matter how she was feeling, she was always glad to see new people and greet them even if she wasn’t able to get up. This time she didn’t, and I really needed her to show me she was ready in that way. Every time it felt like the end was near I would tell her “I need you to tell me, baby. I can’t make this decision unless I’m sure it’s what you want.” I think she told me on Saturday that she was ready to not be in pain anymore. Falling asleep in a hug. What I wouldn’t give to hold her right now! We laid on the floor together and I felt her sleepy breath on my face until she stopped breathing. She was so peaceful. It was the single hardest decision I have ever had to make and I didn’t want to let go of her. My sweet Weezy girl went over the Rainbow Bridge, no longer in pain. Until we meet again, my angel. I love you forever.